Press Release/Hyderabad, 30th Dec 2013: The 2013-14 BFI-IMG Reliance College League tipped off this week in Hyderabad at YMCA Ground with a spectacular opening ceremony. Mr. GM Sampah Kumar, Chairman, Technical Commission, Basketball Federation of India was the Guest of Honour for the evening and was accompanied by Chief Guest Mr. Md. Rizwan, Former Indian Basketball team Captain and Chief Manager, State Bank of India. BFI in collaboration with the IMG Reliance and State Basketball Associations is organizing the 2013-2014 BFI-IMG Reliance College League in eight cities across India to help develop and promote an organized structure of basketball in colleges. The college winners from all the states will participate in the National Champions Cup to be held in April/May, 2014 in New Delhi. The 2013-14 edition of the BFI-IMG Reliance College League includes 2 new cities – Indore and Hyderabad – in addition to last year’s returning 6 cities New Delhi, Mumbai, Indore, Ludhiana, Hyderabad, Kolkata, Bangalore and Chennai. The leagues will comprise of 20 teams per city (10 men’s & 10 women’s). A total of 1,920 kids and 160 teams are participating across the country. Each team will play a total of 8 games over a period of 2 months and a total of 640 games will be played during the group stage, which will be followed with a knockout tournament to crown a City Champion. Games will be held at rotating locations in different colleges to provide any institution the opportunity to host the league. One of the main goals of the College League is to start the first pan-India League, as opposed to the current system of competition – tournaments. 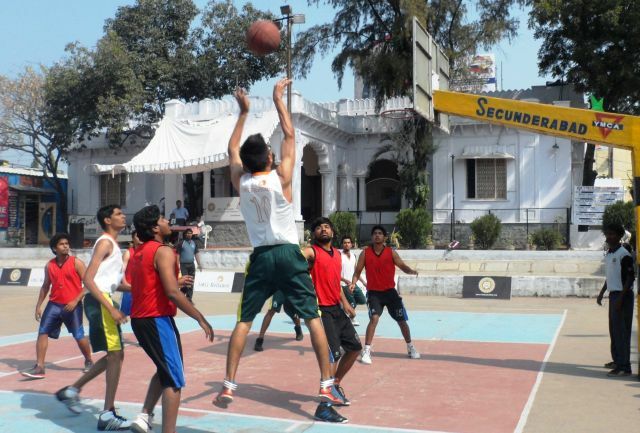 As part of the 2013-14 College League, BFI and IMG Reliance have put aside money for each participating Colleges for refurbishments of their home courts. With the help of the State Basketball Association, BFI and IMG Reliance hopes this initiative will incentivize colleges to invest in basketball. On the opening day of the College League in Hyderabad Santosh scored 20, Vishal 16, Jonah 13 and St. Martins Engineering College men beat AV College 55-51. Both teams were matching basket for basket throughout the match. With just 2 minutes for the final whistle Martins was leading 53– 48, AV College resorted to full court man to man marking and were stealing the ball but were unable to convert it into baskets. Sai scored a 3 pointer to bring down the lead to 55–51, but Martins scored through a fast break to make it 55–51 and held on to the lead for the final seconds. The men from Muffakham Jha College of E&T beat Mallareddy Engineering College 39-25. Tribhuvan scored a game high of 15 points and KM Omer finished with 11 for Muffakham Jha College of E&T. The opening match of the women section saw Government College of Physical Education defeat St. Martin’s Engineering College 35-31. Both teams were matching basket for basket throughout the game. In the 4th quarter the scores were 27 points apiece with two minutes for regulation time. Preeti of Government CPE scored 3 quick drive-in baskets in the final minutes to win the match for her side. Bhavya scored 18 and Preeti finished with 16 for Government College of Physical Education. St. Martins Engineering College (Santosh 20, Vishal 16, Jonah 13) Bt AV College (Samson 18, Sai 17, Kiran 10) 55-51 Ht: 25 – 25. Muffakham Jha College of E&T (Tribhuvan 15, KM Omer 11) Bt Mallareddy Engineering College (Manav 9, Kaushik 7) 39-25 Ht: 14 – 8. Government College of Physical Education (Bhavya 18, Preeti 16) Bt St. Martin’s Engineering College (Priya 12, Aishwarya 8, Manisha 6) 35-31 Ht: 13 – 17. Top 4 teams from each group will qualify for the Knock-Out. 3 St. Martins Engg. Coll. 4 St. Martins Engg. Coll.